you're going to encounter files that end in a .yml extension. YAML is a data serialization format. understanding of what you're looking at. 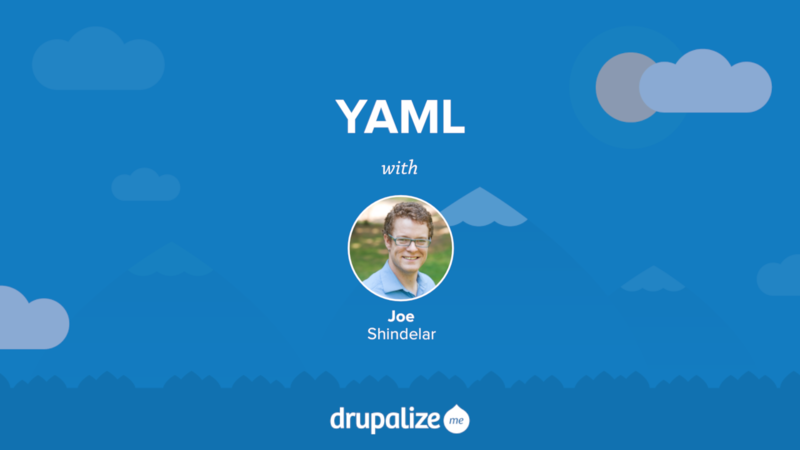 YAML, which stands for YAML Ain't Markup Language, is a human-readable data serialization format that's been widely adopted in a variety of use cases in Drupal 8. Anyone wanting to write modules, or themes, for Drupal 8 will need to understand YAML syntax. Even site-builders are likely to encounter YAML at least in passing as YAML is the data-serialization format of choice for Drupal 8's configuration management system. Good thing it's pretty easy to learn even with the most basic of programming backgrounds. This tutorial will look at the YAML data format and provide examples of how to write and read YAML. Starting with an introduction to the language's syntax and some of the strengths of YAML. Then looking at the difference between scalar data types like strings and integers, and collection data types like lists and associative arrays. Since YAML in the Drupal world is read into PHP and ultimately becomes a PHP data structure that we can use in our own code we'll also look at how the YAML we write in a .yml file is represented in PHP data types. To do this we'll use the YAML Sandbox module that provides a handy textarea into which we can type YAML and have it parsed into PHP data structures.